Mitchell Gaynor, MD, is a board-certified medical oncologist, internist, and hematologist. 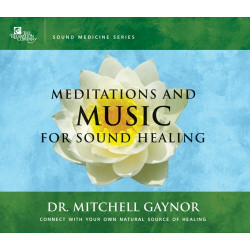 He is also a best-selling author, and has published numerous books, including Nurture Nature Nurture Health: Your Health and The Environment; The Healing Power of Sound: Recovery from Life-Threatening Illness Using Sound, Voice, and Music, Dr. Gaynor’s Cancer Prevention Program (developed with Jerry Hickey, RPh); and Healing Essence: A Cancer Doctor’s Practical Program for Hope and Recovery. 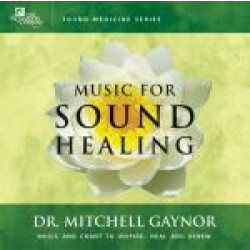 Dr. Gaynor pioneered the use of sound, chanting, and music in conjunction with metal and crystal singing bowls as an adjunct to conventional medical therapy. Dr. Gaynor has benefited thousands of patients via his ongoing healing sessions using meditation and chanting with Tibetan bowls, as well as his sponsorship of spiritual retreats in southern India. Dr. Gaynor is a frequent speaker and lecturer at hospitals, conferences, and universities throughout America and abroad. Dr. Gaynor was previously director of medical oncology at Weill-Cornell Medical College for Complementary and Integrative Medicine. He was also the director of medical oncology at the Strang Cancer Prevention Center, where he is still affiliated as a consultant. He served on the executive review panel at the Department of Defense (Alternative Medicine for Breast Cancer Sector) and participated in the Smithsonian Institute's Symposium (New Frontier in Breast Cancer and the Environment). Dr. Gaynor has been consecutively listed in The Best Doctors in New York since 1997, and has served on the board of advisors for Healthy Living magazine and the Sass Medical Foundation. He also has been a member of the editorial board of Integrative Cancer Therapies. In addition to his work with sound and singing bowls, he has published studies on oncology and the effects of environmental toxins on health in peer-reviewed journals such as Seminars in Hematology, The American Journal of Clinical Oncology, and The Proceedings of the American Society for Clinical Oncology and Environmental Health Perspectives. For his work, the New York State Assembly awarded him their Environmental Advocacy Award, and the Mid-Hudson Options Institute named him Environmental Advocate of the Year in 2002. 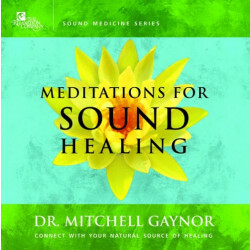 Dr. Gaynor is well-known in the media as an integrative medicine specialist and is frequently called upon to discuss such topics as nutritional aspects of cancer prevention; environmental threats to health; complementary cancer therapies; the dangers of carcinogens and health; and spirituality and healing. He has been featured in many national publications including the New York Times, Newsweek, Self, and GQ, as well as Healthy Living, Body and Soul, and Spirituality and Health. His appearances on television and radio are extensive. In 1999, he was a guest on 29 radio shows. Last year, he taped shows for National Canada Radio, local stations in Vancouver, British Columbia, and stations throughout America. He has appeared widely on television, including CBS Evening News (with Dan Rather), ABC's Good Morning America, the Discovery Health Channel, Fox News, WNET-Channel 13 (with Dr. Frank Field), Healthy Living (with Jane Seymour), CBS' 48 Hours, and CNN's Your Health. Dr. Gaynor received his medical degree from the University of Texas (Southwestern Medical School). He was a clinical fellow in hematology-oncology at the New York Hospital-Cornell Medical Center and a postdoctorate fellow in molecular biology at Rockefeller University. 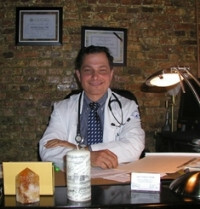 Dr. Gaynor is 47 years old and was born and raised in Plainview, Texas. He lives in New York City with his wife and two sons.